The Antis: anti-imperialist or anti-feminist? A recent article on "imperialist feminism" accuses the US women's movement of being a cheerleader for American empire from the war in Afghanistan to the present. Is this a sectarian strategy that misses the target and attacks the liberals instead of the right? A leftwing analysis that blames the suffering of women in Muslim-majority countries on the feminist movement - variously identified as "white feminists", "liberal feminists", or "colonial feminists" and their "native informants" or "comprador intellectuals in the South" - has become influential in US academic feminist circles. While its proponents call themselves "anti-imperialist feminists", in the interests of brevity I will call them simply the Antis, in tribute to the anti-suffrage leftists who considered women's rights a bourgeois distraction from socialist revolution. A recent article by Deepa Kumar titled "Imperialist feminism and liberalism" argues that US liberals and feminists supported the invasion of Afghanistan and ignored the victims of the war in Iraq because of their "ubiquitous, taken-for-granted ideological framework that has been developed over two centuries in the West...based on the appropriation of women’s rights in the service of empire". What evidence does Kumar present for this thesis? What historical documentation? A CNN interview with Reza Azlan, an article from the Washington Post about a UAE woman pilot, an Amnesty International campaign on Afghanistan, and an ad for the HBO drama series Homeland. These are hardly feminist sources. In an article about American feminism, her only American feminist reference is to a 1991 piece on women and the military by Naomi Wolf. If Kumar knew more about the US women's movement, she would know that, far from being a mainstream liberal feminist, Naomi Wolf has for years been concentrating on conspiracy theories about a US descent into fascism. The Antis misrepresent feminist movements, ignore the struggles of women against politicized religion in Muslim-majority countries, and have a reductionist analysis of women's liberation. Kumar , for instance, claims that "Liberals and feminists in the US, going against the wishes of Afghan feminist organizations such as RAWA (Revolutionary Association of the Women of Afghanistan) who opposed US intervention, linked arms with the Bush administration and supported the Afghan war". This argument treats US feminists as a monolithic bloc and obscures the range of political opinion in the Afghan women's movement. A closer look shows a more complex picture. 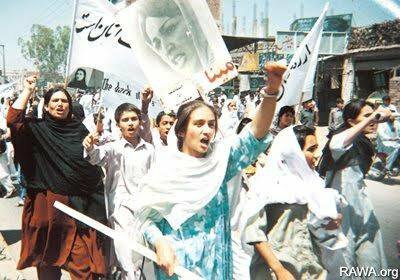 In 2009, for instance, at the same time that Malalai Joya and RAWA were denouncing the occupation, human rights activist Wasma Frogh and Women for Afghan Women (WAW), a substantial network of NGOs that work on violence against women, were calling for a continued commitment of coalition forces. And in the early years of the war, RAWA did not oppose US intervention against the Taliban. It opposed US support for the Northern Alliance, which is not the same thing. Throughout the nineties, the Clinton Administration tried to win Taliban support for an oil pipeline bypassing Russia and Iran; administration officials held a number of meetings with the Taliban and toured a dozen Taliban leaders around the country. Opposing US diplomatic recognition for the Taliban, RAWA and the Feminist Majority, an American liberal group, worked together on a campaign about gender apartheid in Afghanistan, hosting celebrity events to raise money for girls' schools and calling for emergency aid to Afghan women. 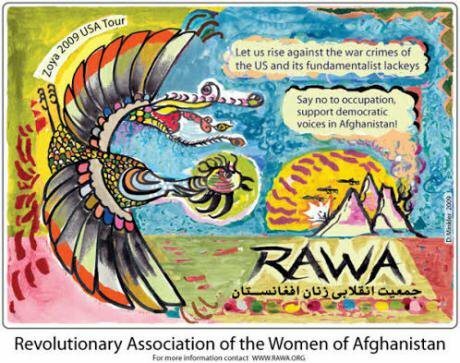 RAWA was the Afghan face of this campaign, which was also promoted by Eve Ensler. Because of its visibility in the West, RAWA became the go-to group for journalists, but when the war began, they made contact with other women's groups as well. In 2002, the Feminist Majority bought Ms. Magazine and did a section on Afghan women, spotlighting Dr. Sima Samar, founder of the Independent Human Rights Commission. RAWA objected strenuously, denouncing Samar and other Afghan women's groups as conciliators with fundamentalism. That is why RAWA and the Feminist Majority split, not because RAWA opposed the war. It is also disingenuous to say that US goals in the war had anything to do with women; Ann Jones and others have documented the hypocrisy in this claim. Bush wanted to destroy al Qaeda, punish the Taliban for giving it shelter, and protect US oil interests. Nobody in the administration even mentioned Afghan women until six weeks after 9/11. Then, as it became clear the war was not going to end quickly, the State Department released a report on the oppression of Afghan women and children, and Laura Bush - hardly a feminist - gave a radio speech on the subject. While some American feminists jumped on the bandwagon, many others saw this as a cynical use of women for propaganda purposes. As Deniz Kandiyoti observes, "far from inspiring an unqualified response of international feminist solidarity, the US military intervention provoked a spate of critical reactions triggered by the naked instrumentalism behind the invocation of abused Afghan women." In the wave of nationalist feeling that followed 9/11, many dissenters were feminists. The Village Voice even did a piece on feminist opposition to the war, quoting a petition signed by Gloria Steinem, Alice Walker and others saying, "We will not support the bombing or U.S. invasion of Afghanistan, for it would only punish suffering people and increase the hatred on which terrorists feed." A number of antiwar articles by American and international feminists can still be found on the website of Women's WORLD, including Barbara Kingsolver, Rosalind Petchesky, Anne Walker, Muna Hamzeh, the late Sunila Abeysekera, Barbara Ehrenreich, Ritu Menon, Nafisa Hoobdhoy, Ellen Willis, and myself, along with an online symposium about how to strengthen antiwar voices. Though Kumar's subject is feminism and empire, she ignores the struggles of feminist movements in Muslim-majority countries, where empire and government are often closely aligned, and talks only of representations of Muslim women in Northern media. But the best stories don't get into the Northern media. A war has been going on for months in the Kurdish enclave of Rojava, where PKK women soldiers have been leading the battle against ISIS slave traders; Northern media have delighted in pictures of these women but said little about the political ideas that animate them. But Kurdish secularists fighting Islamists don't fit into Kumar's paradigm; nor do struggles on the ground against the use of politicized religion as a tool of oppression and social control, documented in various regions by feminists including Karima Bennoune, Michelle Goldberg, Rohini Hensman, Frances Kissling, Gita Sahgal, Amrit Wilson, Afiya Zia, and many others. For the Antis, the only struggle that counts is the one against imperial imagery. As I observed in Double Bind, this myopia can be seen in several sectors of the left and peace movement, who have no problem allying themselves with any tendency they see as anti-imperialist regardless of its political agenda. 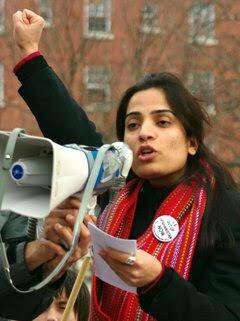 Saadia Toor, another Anti and the author of The State of Islam: Culture and Cold War Politics in Pakistan, goes so far as to characterise feminists as front women for US imperialism. "As the United States draws down its troops in Afghanistan...we have begun to see this ‘imperialist feminism’ emerge once again from a variety of constituencies both within the United States and internationally. One such constituency locates itself on the left-liberal spectrum in the United States and consists of an alliance between self-defined left-wing feminists in the United States and feminists from the Global South (specifically Muslim countries such as Algeria and Pakistan)." No distinction is made between the Muslim religion and Islamism as a political project or between different shades of liberals and the left, and the threat of Islamophobia is invoked to shut down any discussion of the Muslim right. To Toor, the continued vitality of "the meme of the Muslim woman who must be saved from Islam and Muslim men - through the intervention of a benevolent western state" points to "a palpable dis-ease with Islam within the liberal mainstream and portions of the Left, a result of the long exposure to Orientalist and Islamophobic discourses." In fact, the "twin evils" of "capitalism and imperialism" are "at the heart of the problems faced by the vast majority of women across the world, and especially in ‘Muslim’ countries". This argument is becoming very tired. Indeed, feminists on the left have been arguing over such reductionism at least since 1848. Is it true, as Toor says, that the problems of women can be reduced to side effects of "capitalism and imperialism"? Or are there problems predating capitalism involving the family, cultural traditions, religious institutions, and systematic institutionalized sexism? I always thought feminists believed in the second proposition, or at least recognized the existence of diverse patriarchal formations. Not these "anti-imperial feminists". For them the only battle worth talking about is the one between US imperialism and the working class. No need to focus on secondary issues like Islamism because, as Kumar says in an article on Hamas, "The class basis of Islamism is the middle class or the petty bourgeoisie. In general, this class does not have the social weight necessary to bring the system to a standstill or force concessions from powerful groups." So much for the Muslim Brotherhood and Jamaat. Besides, she continues in International Socialist Review, Islamists are sometimes anti-imperialist and at those times should be supported, even if their attitude towards women is not what one might wish. This approach fits right in with the SWP's history in the Stop the War Coalition, where women's rights were called "a shibboleth" that should not impede unity with Islamist groups. But such alliances may not always be productive, Kumar warns: "Islamist groups are self-serving entities that are not principled anti-imperialists. We should therefore not make the opposite mistake of offering support to all Islamists at all times." Rather than worry about Islamists, the Antis direct their fire at liberal feminists - whom they do not take great pains to distinguish from any other kind. But it is one thing for Deepa Kumar and Saadia Toor to attack "imperial feminism" in Socialist Worker, where few will read them but other Trotskyists. It is another to make such attacks in Pakistan, where, as women's rights activist Afiya Zia says, "Their attempts to malign liberal and secular feminists and human rights activists as supporters of war, drones, and military intervention end up confirming right wing accusations of the same. While they clearly wish to offer themselves as the true 'radical' opponents of imperialism, in fact they offer no political resistance at all, simply empty talk that depends on delegitimising what little resistance there is in the country to Islamists and conservative politics". Since the nineties, feminists in many parts of the world have warned of the growing strength of fundamentalist movements - Protestant, Catholic, Hindu, Jewish, Orthodox and Buddhist as well as Muslim. We have warned that these movements were a threat to human rights and world peace comparable to that of fascism in the thirties. In Weimar Germany, the left was too sectarian to unite against the Nazis until it was too late. Today as then, an energetic defense of individual human rights - that cornerstone of liberalism - is essential to any workable leftwing strategy. That means we must fight both empire and fundamentalism. By focusing their attack exclusively on liberal feminism, the Antis demonstrate that they have learned nothing from history. Read more articles on openDemocracy 50.50's platform Gender Politics Religion exploring the prospects for gender equality and pluralism.